Stars such as Bev Callard, who plays Liz McDonald, former Red Dwarf actor Craig Charles who plays Lloyd Mullaney and Jack P Shepard who plays David Platt ans several other stars posed with oversized postcards produced by campaign organisers who include DPAC(3) (Disabled People Against Cuts), GMCDP (4)(Greater Manchester Coalition of Disabled People), Inlusion London(5), Equal Lives(6) and others. Despite having their original decision to close the fund over-turned at the Court of Appeal late last year(7), the Government has re-announced the closure following a new Equalities Analysis(8) – where officials admit levels of support cannot be maintained and some users may end up having to move into Residential Homes to have their support needs met. 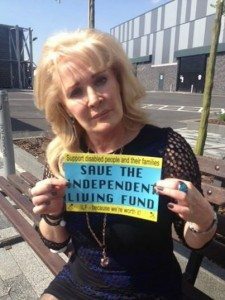 Funding will be devolved to Local Authorities for 1 year until 2016(9), but not ring fenced, meaning there is no guarantee the money will be spent providing support for users, or indeed any disability services at all.